Here are our latest exclusive scientific and botanical breakthroughs that rejuvenate your skin. 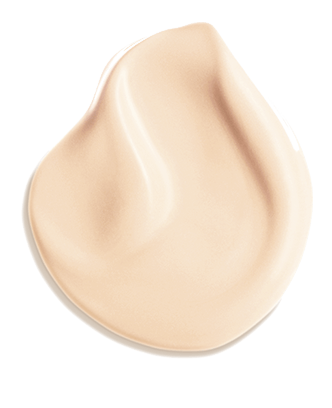 For the first time, Clarins Laboratories has discovered the source of firmness in zones where young cells gather and hold immense regenerating potential. Research shows that these reserves are depleted as we age. And it shows: skin loses firmness, wrinkles appear and facial contours are less defined. The ethnobotanists at Clarins traveled to Australia to study kangaroo flower. The flowers that grow at the end of its stem increase the plant’s ability to propagate by attracting pollinating birds. Just like the group of young cells helps the skin regenerate itself. 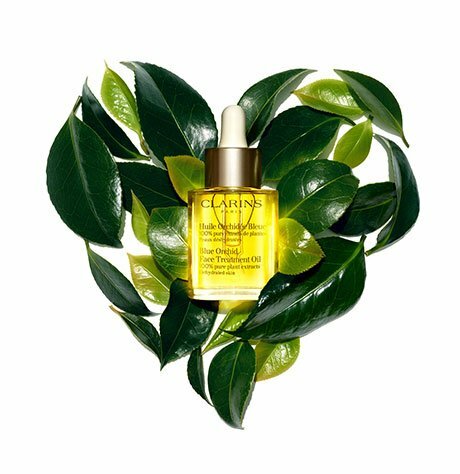 Clarins sourced a new organic girdlepod extract in Burkina Faso that has a triple action on collagen and elastin fibers and on the firming bonds that visibly improve the skin's elasticity and firmness. Your face stays as expressive as ever without creasing. 11:00 PM and 2:00 AM. 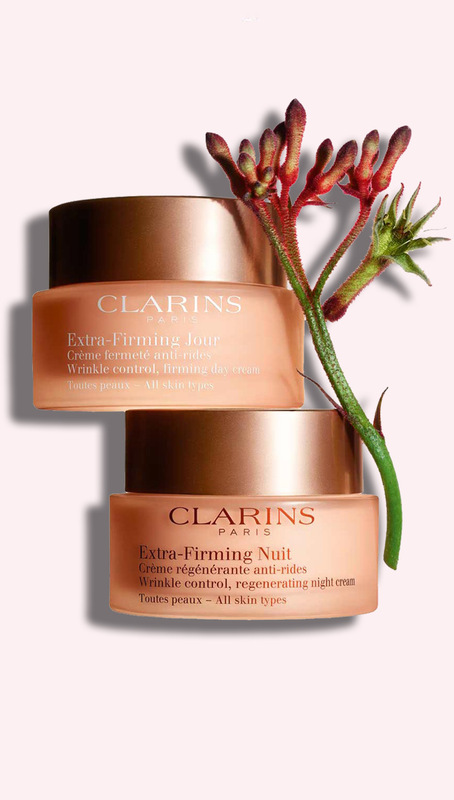 By comparing the nocturnal activities of young and old fibroblasts, Clarins discovered that two of their regenerating activities slow down with age. Lasso the moon for the best nocturnal regeneration! Better yet, hydrated moonstone silica extract. By acting on the fibroblast’s two nocturnal mechanisms affected by age, it helps optimize the skin’s nocturnal regenerating process. Extra-Firming is a line of skincare products that rejuvenate your skin – but that’s not all! These formulas provide the latest scientific and botanical breakthroughs in caring for the skin. Firm skin means perfectly hydrated skin, so every day and night Extra-Firming skincare products contain our finest active plant ingredients for moisture and comfort. Traditionally, shea butter and shea oil, which are rich in fatty acids, help nourish and protect the skin. In cosmetics, shea unsaponifiables soothe and protect the skin. Clarins Laboratories uses organic shea butter. Organic leaf of life extract helps boost the skin’s natural hydration mechanisms. Your skin’s capacity to retain moisture is restored thereby promoting perfect hydration. The extract used by Clarins Laboratories is organic. Your skin needs as much protection as it can get against external aggressors, so the new Clarins Anti-Pollution Complex prevents ageing of the skin by targeting all the harmful effects of internal and external pollutants. A red algae common to the coasts of the North Atlantic, furcellaria loves light. We extract the water-soluble gum, which is used in food for its thickening, gelling and stabilizing properties. In cosmetics, furcellaria extract helps protect pollution-exposed skin against dehydration. In the Middle Ages, the first medical “school” in the West classified it as a cure-all. Its reputation declined in the early 20th century, only to come back stronger a short time later in the cosmetic field. Rich in antioxidant rosmarinic acid, organic sanicle extract helps protect the skin from the harmful effects of free radicals. The African ebony tree is revered by local populations because it provides multiple benefits, primarily medicinal. Its leaves are used to treat skin conditions such as scarring. In cosmetics, African ebony extract protects the skin against the harmful effects of pollution and free radicals. It has long been used to heal scabies and soothe irritation caused by breastfeeding (hence its name “nipplewort”). In cosmetics, succory dock-cress extract, with its anti-free radical properties, helps stimulate the skin’s natural defenses against environmental aggressors. As we age, our hormones change, the skin is increasingly susceptible to pigmentation issues and dullness. Don't worry! 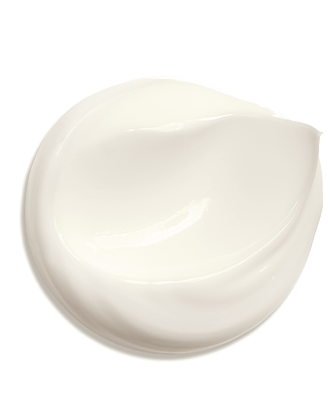 Extra-Firming contains active ingredients that fight dull complexions. It is an integral part of daily life in the dry regions of Africa and Asia where it's used as food for humans and livestock, a medicinal plant, building material and fuel. Organic desert date extract selected by Clarins research helps slow down skin hyper-pigmentation. At 40, the years of going at full blast are behind you. Even if you handled that time like a pro, it starts to show on your face. That’s why your skin needs a little boost now and then to look its best. Long known at Clarins Laboratories for their instant toning effect, oat sugars are your best friends for erasing wrinkles and reviving your face as a whole. By reactivating the skin’s oxygenation process, it brings back radiance, which acts against the dulling effect that fatigue can have on your skin. * Clinical test of 34 women over 40, who applied Extra Firming Day - Normal Skin for four weeks. ** Clinical test of 22 femmes over 40, who applied Extra Firming Day – Normal Skin for four weeks. 89%* of women say it's the pro duo for firm skin that lasts longer. *Satisfaction test – Extra-Firming Day All Skin Types & Extra-Firming Night All Skin Types - 107 women – 14 days. At Clarins, we are constantly concerned with the quality and effectiveness of our products. More than that, every day our teams strive to combine effectiveness with skincare that is pleasant to use, all while ensuring it respects nature and people. In addition to your Extra-Firming Day & Night skincare routine, do these three exercises every day to tone and firm up your facial muscles. Pick a quiet time, get comfortable sitting or standing with your back straight, and GO! Open your mouth to form an O, then curl your upper lip over the gums. And we certainly never forget about feeling great! In addition to unprecedented anti-ageing effectiveness, the new Extra-Firming creams offer everything women love in a cream: ultra-sensory textures, an irresistible scent and a modern look! 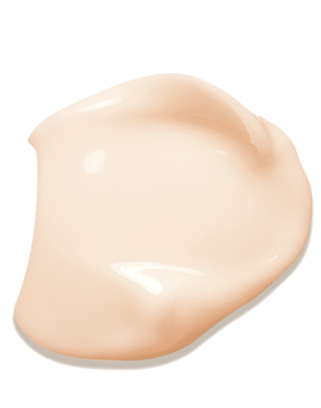 The soft and enveloping Extra-Firming textures provide an instant feeling of comfort and a firming effect. The Extra-Firming line exemplifies the brand’s commitment to preserving biodiversity and making life better for future generations. 25% recycled glass and box from sustainably managed forest. 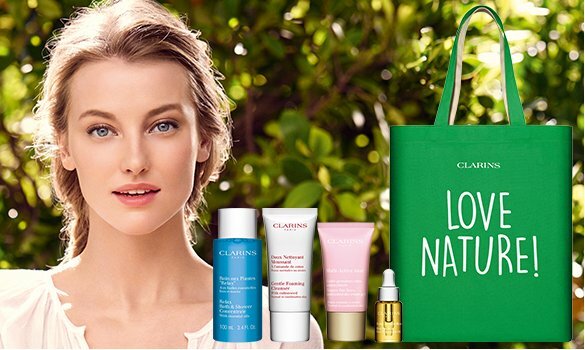 Clarins helps protect natural resources by sourcing sustainable materials and promoting a circular economy that puts the raw materials from recycling back into circulation. 85% of the active ingredients in the Extra-Firming line are derived from plants and half of them are organic. Three fair-trade agreements in partnership with the Jardins du Monde association. The purchase price for leaf of life, girdlepod, and African ebony tree includes a contribution to improve the economic and social development of the people who harvest them. Biomimetic extraction inspired by the plant intracellular environment utilized to extract low-soluble molecules in the lipid and aqueous phases, which before then had been difficult to extract with conventional extraction methods.